This part of the world has a lot going for it: verdant nature, great vistas, a world-class river. But one of the areas where it cannot pat itself on the back is an abundance of good, let alone, great bakeries. And when you think about it can a community, any community, describe itself as a truly civilized place without a storefront pumping out the transporting smell of fresh bread? Not to mention fine pastry? The cookie aisle at the local supermarket will do in a crunch. But it really can’t compete with a well-crafted buttercream chocolate cake, a lively mocha éclair, or a warm sea salt chocolate chip cookie. So it came as a pleasant surprise when, in 2016, the Bartlett House, an historic railroad hotel from the 1800’s in Ghent, NY was renovated and turned into a restaurant, café and bakery. That’s the other thing about bakeries. They should be within easy driving and better yet walking distance. Not too long ago I asked a French chef how Paris manages to support a bakery on seemingly every block. His explanation was that people are loyal to their neighborhood bakery. That’s where they go to pick up their morning croissant and their daily baguette. In a way I suppose they see it as an extension of their kitchens. Bartlett House is an approximately five mile, ten minute drive from our house. In a rural community such as ours that’s the equivalent of next door. But just because a new bakery opens near you doesn’t guarantee it’s going to be any good. I flatter myself that I know my baked goods but I’m far from a snob. My standards are high but not effete. I haven’t met the cookie, cake, or come to think of it pretty much anything else that couldn’t benefit from a generous layer of frosting, a downpour rather than a drizzle. So when the Bartlett House opened I would have been satisfied if they’d produced a dependable cake and cookies. It came as rather a shock when I bit into their croissant – it looked authentic sitting there on the café’s scenic counter but looks can be deceiving – and discovered it the equal of the best Parisian croissant. In other words a full-bodied sensory experience, a celestial butter delivery system, an elegant invitation to unite it with a helping of excellent strawberry or raspberry jam as quickly as possible. Whether a croissant should also be slathered with additional butter – I think it should, but as you’ve probably gathered by now I see little benefit in self-deprivation – is open to spirited debate. But their croissant was flaky on the outside with a cloudlike interior and the sort of locally sourced fresh ingredients that, when bonded through a process that seems as much alchemy as chemistry, gets the brain firing on all cylinders; that reminds you that for all our woes and missteps humanity is a rather noble experiment. And I haven’t even mentioned their pistachio croissant. 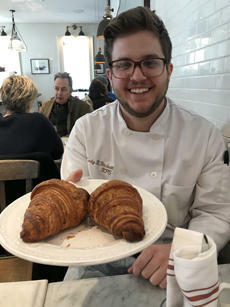 As described to me by chef Cody Fitchett and Alina Roytberg, one of the co-owners of the Bartlett House, that dopamine engine starts its day as a classic croissant, gets cut in half, slathered with pistachio cream and simple syrup, and baked again. It’s probably best avoided if you suffer guilt and sweat calories. But if hedonism is a cornerstone of your personal worldview it’s well worth a detour. I’ve also discovered that the bakery does special order cakes, such as a lethal looking dark chocolate cake with hazelnut buttercream. I frankly had reservations about helping to publicize the Bartlett House. It’s popular enough, especially on weekends. In the past I’ve had to call ahead to reserve a croissant or two against the heartbreak of showing up in late morning and discovering them all gone. But the staff assures me they rarely run out any longer and are actually ramping up production to supply a new project of Ms. Roytberg’s and her partners Lev Glazman and Damien Janowicz – the soon-to-open Maker Hotel in Hudson, NY. Ms. Roytberg and Mr. Glazman are also the co-founders of Fresh, the natural beauty products company. I bring this up only because they seem to have an eye for quality, the ability to set and achieve lofty goals, and most important from my point of view, Ms. Roytberg’s frequent travels abroad have afforded her the equivalent of a PhD in croissant appreciation. Bartlett House’s croissant production is actually a four-day process. On Day one the ingredients are measured. Day two the dough is mixed (the formula seems a one-to-one ratio of dough to high fat content European-style butter) and then allowed to freeze overnight. Day three the dough is shaped into croissants. Day four it’s baked and shared with the Hudson Valley’s discerning clientele. I’ve also discovered they freeze nicely, though obviously nothing quite compares to the lightning in a bottle experience of starting your day with a perfectly rendered fresh croissant. Snowstorms are more complicated than they used to be. I’m not referring to the weather, though that, too. I read that because of global warming we can expect more balmy winters, or at least balmy Decembers, followed by blizzards and bone chilling polar vortexes, or is it vortices, later in the season. I was filled with sadness the other day when I got off the phone after cancelling my 94-year-old mother’s New York Times subscription. Ralph Gardner Jr: Can Trees Talk? Snap quiz. What are the large organisms that surround us, that provide beauty and shade, fuel and shelter, but that we know least about? I guess I gave it away with the shade part. I hadn’t visited the Clark Art Institute in Williamstown, MA for a while since my last trip occurred before their 2014 renovation. The changes include thousands of square feet of additional gallery space, a new entrance with an all-glass pavilion, and ambitious landscaping that incorporates a three-tiered reflecting pool, lawns, meadows and expanded walking trails.